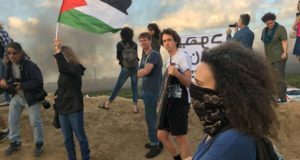 At Vittorio’s funeral in Gaza the crowds chanted “Viktor is with the fisherman, Viktor is withthe farmers”, Vittorio is still with the people of Gaza. He lives on in their hearts. He has been honored with a football tournament in Rafah, with a street in Gaza, with a school in the JordanValley, but I think that perhaps the honor that would be closest to his heart is the VittorioArrigoni – Stay Human summer camp in Beit Hanoun. Vittorio had worked in Beit Hanoun his entire time in Gaza. Riding in ambulances during Cast Lead and supporting the weekly demonstrations against the buffer zone since then. The Fursan Al Ghad Youth Center honored him by naming their summer camp in his honor, the Vittorio Arrigoni – Stay Human summer camp. Fursan Al Ghad is a small center, just a small three room building, a courtyard, and a van. It is a center with big goals though. It seeks not only to provide the children with a safe spacefor summer fun, but to remind them that they are part of something bigger than themselves. The children not only participate in art and music programs, but they also perform community service and protest the occupation. 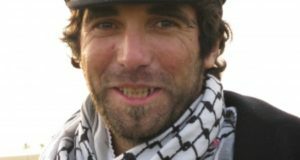 The Vittorio Arrigoni – Stay Human camp opened in mid-June. It serves sixty children from age eight to fifteen. Sixty children in one small building. Every morning the children stream in at nine A.M. Soon the entire building is alive with singing, dancing children. Like Vittorio, the teachers at Fursan Al Ghad love to sing, Bella Ciao, Inadakoom, traditional Palestinian songs. The children love to both sing and dance debka. Many of them are surprisingly good, eight year old Fred Astairs. The children also do art projects, both in the classrooms and outside. The wall across fromFursan Al Ghad is now covered in a beautiful new mural. The most beautiful project though,was building kites. A dozen amazing kites with beautiful geometric designs. The kites had longtails made from old homework cut into strips, perhaps to celebrate the end of the school year.On the kites the children wrote messages, messages like “the children of Gaza deserve freedom”and “end the siege”. We went out to the hills east of Beit Hanoun, on a beautiful Tuesday morning to fly the kites. 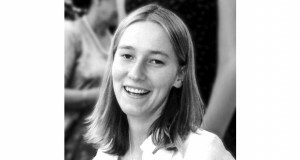 The wind was brisk, the air was beautiful, the kites soared into the air. After admiring them for a while, the strings were cut, the kites sailed across the wall towards Sderot, hopefully the messages carried by the kites will be read and understood. Kids being kids, the camp also provides games and sports. Days were organized to play football,basketball, volleyball and jump rope. The children participated in a 1k race; the five winners received t-shirts. There was even a trip to the beach so the children could go swimming. That was, obviously, a very popular day for the children. Going to the beach is one of the few trips that children can take in Gaza; the siege prevents them from leaving, even from going to the West Bank or Jerusalem. The children also learned about being part of a community. One day was devoted to cleaning the streets of Beit Hanoun. Sixty hands makes light work. They left a mural across from Fursan Al Ghad for everyone to appreciate. Perhaps the best day though, was the last day. The children went to club where they could ride horses and camels. After being entertained for a few hours of singing dancing clowns, the horses were brought out. The children were entranced. Even the ones that were afraid couldn’tpass up the opportunity to ride the horses. They also enjoyed seeing their teachers ride horses,some for the first time. After they were finished riding horses the children came to the port of Gaza. At the port, they boarded boats, and went to sea, some for the first time. They did this in memory of Vik, who loved the sea, and loved the fishermen that worked there. Fursan al Ghad strove to not only provide the children with fun things to do over the summer,but to show the children that they can have a positive effect on their community, to help themfind their voice in the struggle for freedom and justice. Fursan Al Ghad remembered not onlythe music of Vik, not only Bella Ciao, but also that struggle was part of Vik. The children notonly sang, like Vik, they raised their voices against the occupation. For this, thank you Fursan AlGhad, for remembering all of Vik.